Gastric plication surgery is the new restrictive bariatric surgical procedure that promises to produce great results with no serious gastric plication surgery complications. More investigative studies are required to establish the surgical procedure as a safe and effective morbid obesity treatment. 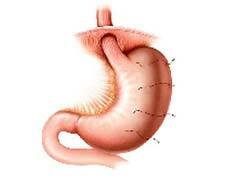 Gastric plication surgery, comparatively, is non-invasive as it does not involve removal of stomach tissue. One or more folds of the stomach are sewed to reduce its size. Sewing is done by making small incisions and using long stitching tools with the help of a camera. Plication procedure has lower complications than stomach stapling or banding procedure. According to a study, laparoscopic plication reduced the risk of slippage than can occur during gastric banding procedure. There are also low gastric plication surgery complications when compared to other popular procedures such as gastric bypass. Some of the gastric bypass surgery complications can include clots, infections, bleeding, formation of ulcers and sometimes even death. As with any surgical procedures, common gastric plication surgery complications can be infections, bleeding and clots. Reaction to anesthesia can also be a complication. Sometimes another complication would be the necessity for an open surgery. It is vital to study the back ground of the surgeons available and choose an experienced one to avoid surgical complications. Since the surgery is relatively new, it is being offered only in a few hospitals. If you are interested in finding out more about gastric plication surgery complications and benefits, visit a bariatric center that offers the procedure and discuss the pros and cons with the surgeon. Experts always advise to keep surgery as a last resort option. Even after the surgery, there is a chance of a weight regain. For long term weight maintenance, you should consider looking into safer weight loss options such as behavioral, commercial and medical weight loss programs as they produce no complications. Best Bariatric Clinic - Top 10 In The US!